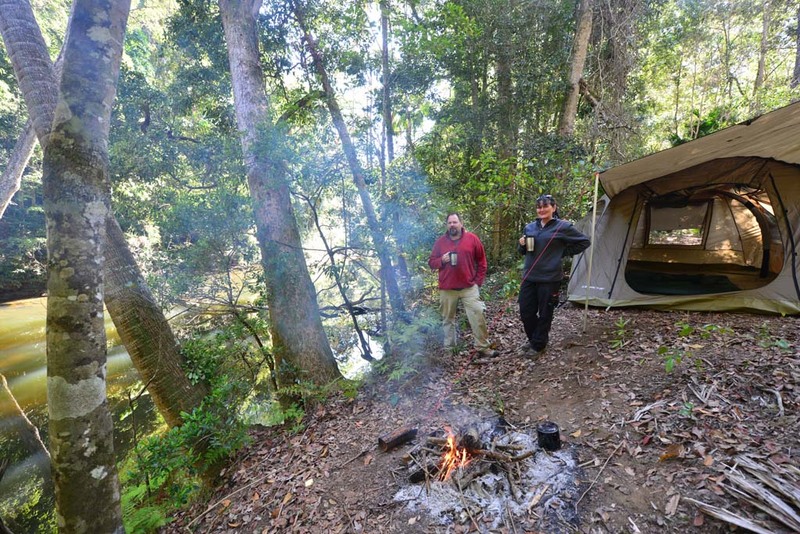 As the mist shrouds the rainforest we set our tent up on the edge of Broken River in Eungella National Park. 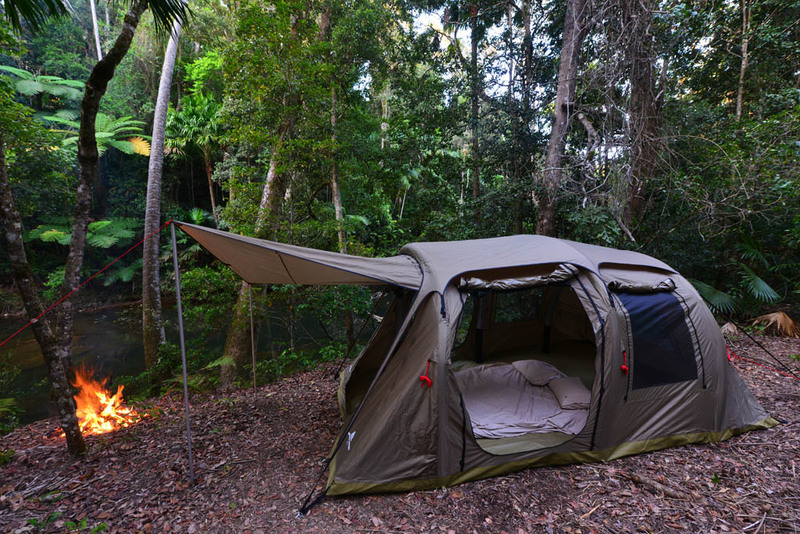 Nestled among lush ferns and towering palms our tent faces out to a platypus pool. Before long the tell-tale bubbles appear and the first platypus surfaces for a short time before making a splash and diving underwater again in his pursuit of shrimps and worms. Last time here, we stayed at Broken River Resort. Since then the campsites have improved and new areas opened up.This time we camp at Fern Flat campsite, a bush camp about 1 km from the main viewing platform and bridge. Tucked away in a natural bush setting, it feels secluded and close to nature. We pitch our tent away from main campsite and camp right on the river’s edge. 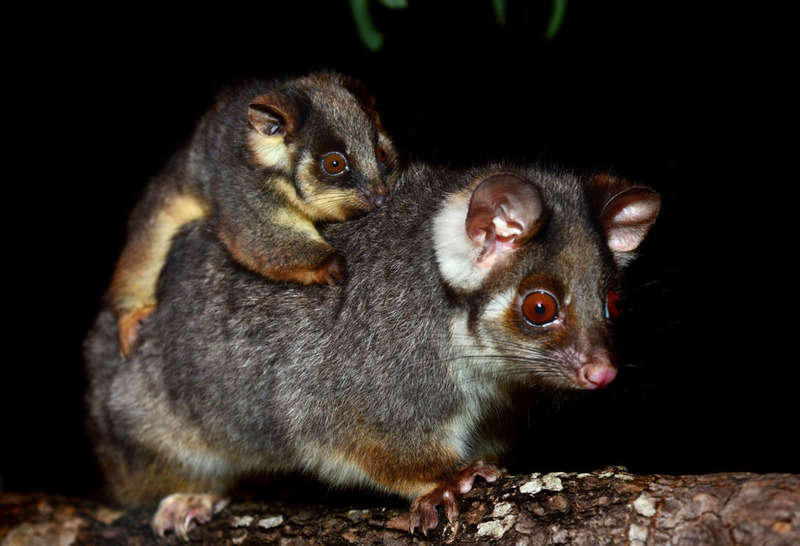 A variety of wildlife lives in the Eungella rainforest including ringtail possums and sugar gliders. With over 227 species of birds it is a haven for birdwatchers. The Eungella honeyeater (endemic to Eungella), kookaburras, kingfishers, crimson rosellas, regent bowerbird, wompoo pigeon and the opportunistic brush turkey are to name but a few. Honeyeaters dart from tree to tree, kookaburras laugh in the treetops and azure kingfishers skim the water in sync with the platypus. 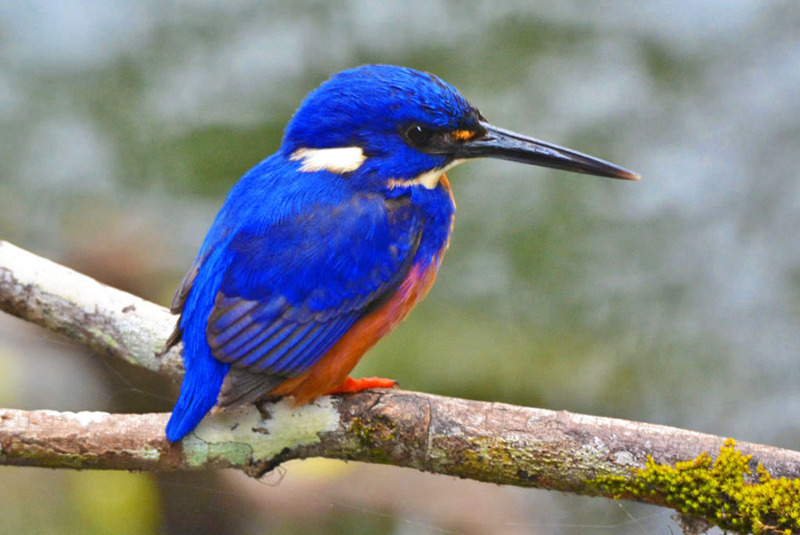 The azure kingfisher is never far away from the platypus. We also spend time trying to photograph the azure kingfisher. After a while, we are amazed that when the kingfisher dives underwater the platypus is close by. The resourceful bird has learnt he can take a share of the platypus food if he dives underwater at the same time! The platypus is hard to spot and even harder to photograph.They surface to breathe, chew their food and keep watch for their next meal and this is usually the only opportunity to photograph them. They have a silvery sheen caused by their two layers of fur which trap air to keep them warm and dry. The shiny sheen and their size is a disadvantage for photos. Many people are surprised by their small size. The females grow to about 40 cm long and the male 50 cm. This cute and peculiar critter reminds us of a cross between an otter and a beaver with webbed feet and a duck-like beak. We are so quiet and don’t move on the river bank; yet when he surfaces his eyes make contact with ours – there is no fooling these vigilant and complex critters. We watch the platypus from our camp and also walk to the viewing platforms and bridge. One afternoon a platypus comes out of the water and suns himself on a log. We have never seen them out of the water before, as they usually only leave the water when digging their burrows. It’s rare to see platypus out of the water. 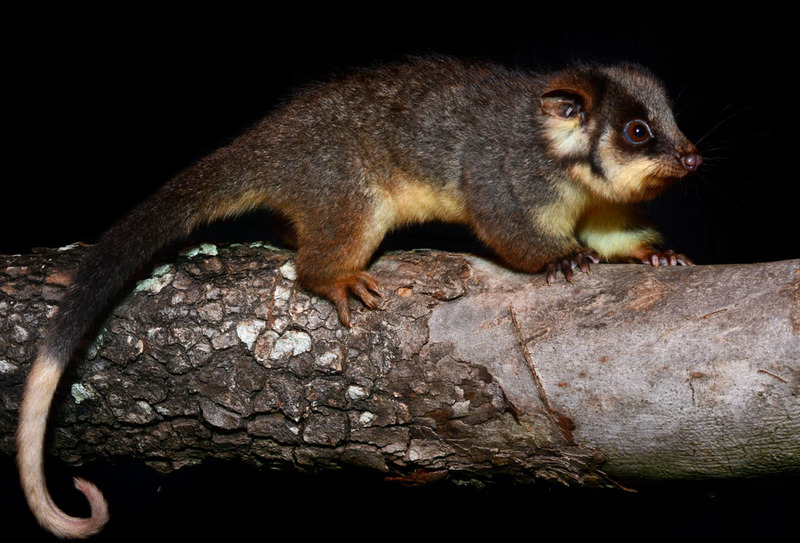 At night as we sit around our campfire and the rainforest comes alive; fireflies twinkle like stars, possums visit our tent, frogs croak, a wallaby thumps past, a flying fox colony noisily leave their roost in their search for food and platypus gently splash in the river beside us. 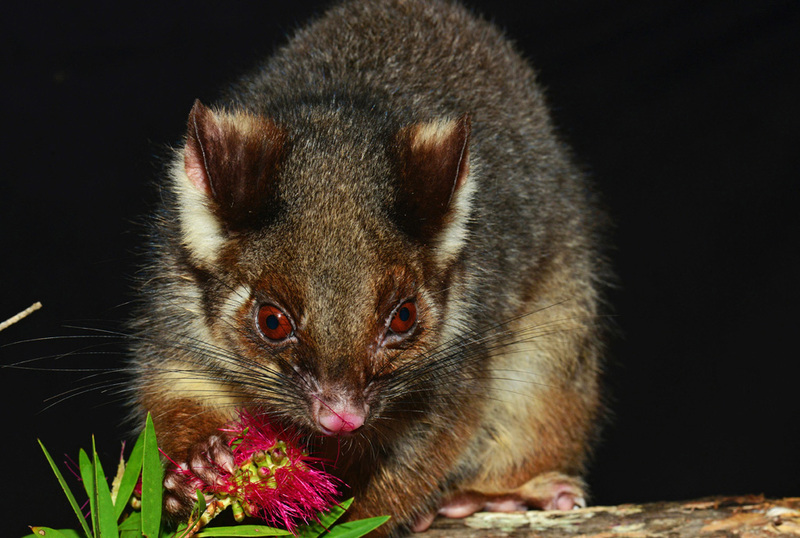 A brushtail possum visits our tent. The location, the bush camping, platypus and other wildlife make Eungella one of our favourite national parks in Queensland. We recommend for anyone with an interest in nature and wildlife to stay here, whether camping or staying in accommodation it is a unique and special place. A picturesque bush setting with plenty of shade. The dirt road to the camp goes into the rainforest for about 700 metres from the Information Centre and kiosk. The road is suitable for most vehicles. Caravans and motorhomes can access this site too but may have trouble in the wet season. Though described that they are reachable by foot only, the campsites are only about 20 metres from the camp car park. Stairs lead the way down to the camping sites from the parking area. Toilet facilities and running tap water (needs boiling before drinking) are available here. This is more secluded and a more natural bush setting than the nearby Platypus Bush Camp. Platypus live in the river here, but the viewing is more assessable and better for photography at the official platforms (about 1 km away near Platypus Bush Camp). Across the road from the Broken River Resort. It’s more in the open, with fewer trees and is less private than Fern Flats. It is busier due to easy access to caravans and motorhomes. Campers can camp right beside their car. There are no toilet or water facilities here. Campers can use the toilets, picnic tables and water at the day use area about 200 metres away. The best thing about this campsite is the platypus viewing platforms are right here. These camps are a great base to set up for a few days. There is a lot to do and many attractions in the area. Over 20 km of walking tracks meander through the rainforest. The 56 km Great Highlands Walk also starts from here. Our favourite is the Credition Creek Track which is 8 km one way. The track follows Broken River and passes rocky ridges, waterfalls, green platypus pools, and vivid-red bottle brush. From here we also spot platypus in the pools below. 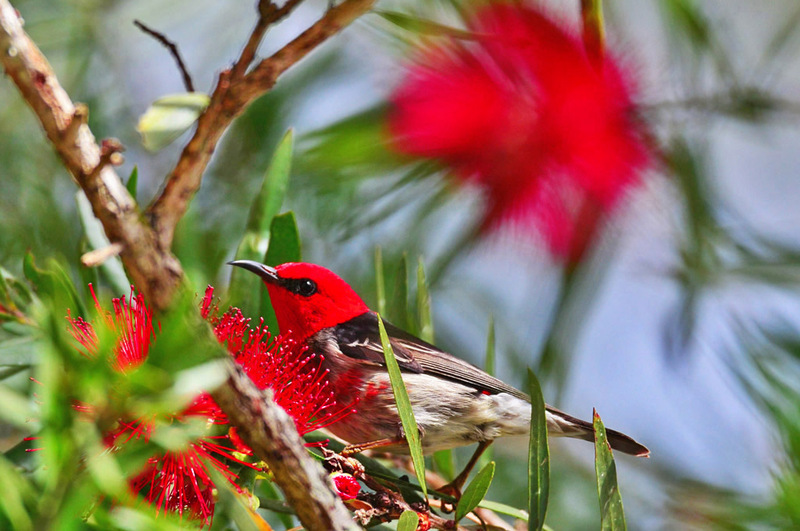 Red-headed honeyeaters love the nectar from native bottle brush. In the township of Eungella there are no supermarkets, only a small corner store. It is a good idea to shop in the towns of Mackay or Marian. For a break from camp cooking, the Broken River Resort restaurant is now open to the public. They serve breakfast, lunch and dinner. During the winter months of June, July and August the temperature can drop down to freezing. The temperature can still be cold all through the year at night except for summer. Fires are allowed in both campgrounds. While photographing platypus blend into the background as they are very alert and shy. 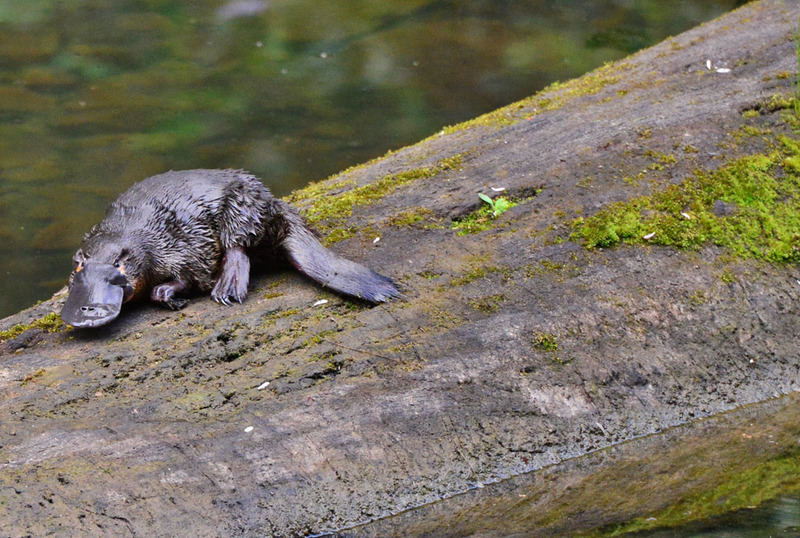 The best times to see the platypus are between 6 am and 8 am and in the afternoon 4 pm to 6 pm. They will also swim around on cloudy days. They don’t like the direct sunlight as this makes them more visible and vulnerable to attacks from birds of prey. Have patience. If they are not visible right away don’t give up! Platypus can hold their breath for 10 minutes, so if they are having trouble finding food it can take this long for them to surface. When they surface to chew and swallow it is only for a short time so get prepared! As they skim underwater looking for food they release bubbles and sometimes a trail of mud from the bottom of the river. Often concentric rings appear on the surface just before the platypus does. Blend into the environment. Wear neutral and dark colours as opposed to bright and fluorescent clothing. Don’t make too much noise and try to avoid quick movements. Platypus are very alert and sensitive. They will see you no matter how good you hide. Even the click of a shutter can make them dive very quickly back underwater. The larger the lens the better for platypus. Our platypus images are taken with a 300mm and 400mm lens. A flash is not necessary. Winter is the best time to view the Platypus. December, January and February can be quiet as the Platypus spend a lot of time in their nest with the new babies. Platypus are very alert and sensitive. They will see you no matter how good you hide. The Platypus is in the monotreme group with the Echidna. 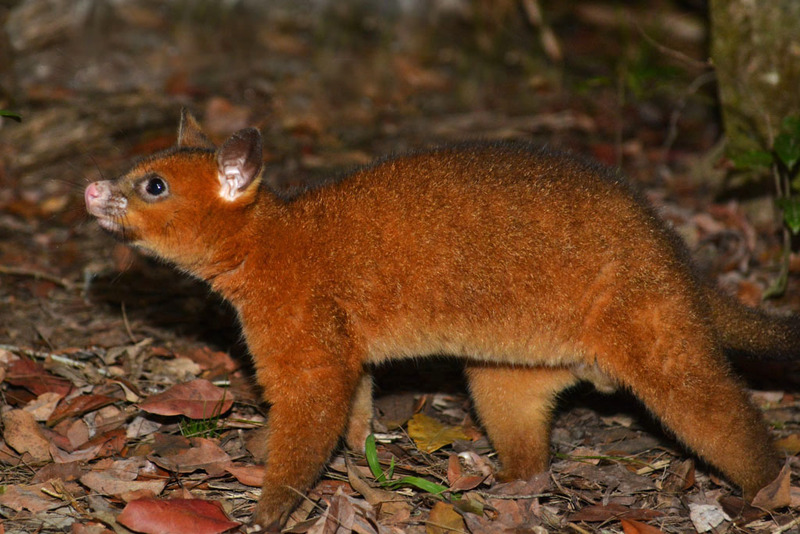 They are endemic to Australia and the only egg-laying mammals. He is a semi-aquatic mammal and has a beaver-live tail, otter-like fur, webbed feet and a duck-like beak. The platypus is found in eastern Australia only. They live in small rivers and streams in Queensland, Victoria and New South Wales. 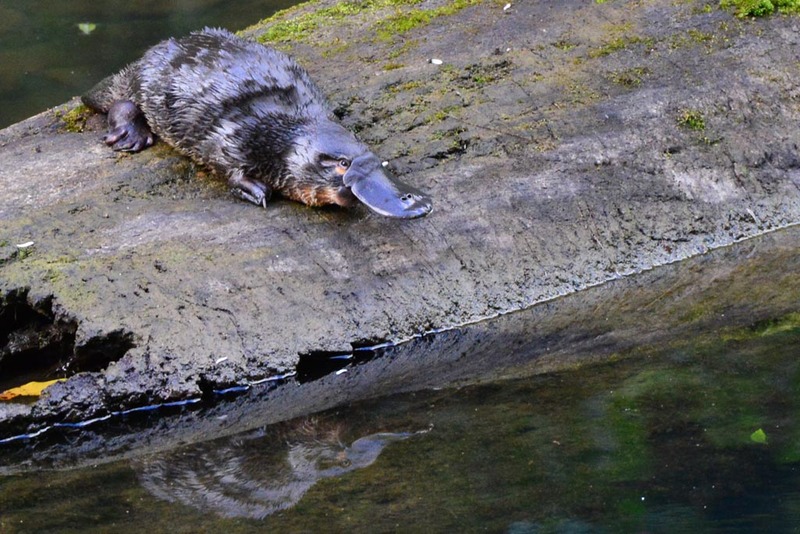 Platypus eat shellfish, worms, larvae, insects, crayfish and freshwater yabby. Though most of the time they are in the water, they will waddle to the river bank to dig their burrows. The burrows have rooms and chambers. When the female is ready to lay her babies she will seal herself in one of the rooms in the chamber and lay one or two eggs. She incubates them for about 10 days. When born they are the size of a tiny bean. Mum will nurse the babies for 4 months. Platypuses are very shy and peaceful but have a trick up their sleeve if threatened. Males have a venomous spur on the back of their hind feet. The venom is not life-threatening to humans but can cause excruciating pain and severe swelling. They rely on electrolocation to find their food. This is a method of using an electric field to locate objects and see. In the early 1900s Platypus were hunted for their beautiful fur because it is thick and waterproof, it was prized by fur traders. Eungella is one of the best places in Australia to see platypus in the wild. Thank you for this article. I love Australian wildlife, the cassowary and platypus are my favourites, because they are so unusual. I love your articles and images, they are beautiful and so real. I hope one day I make it to your beautiful country. Thank you, Rehana. The cassowary and platypus are some of our favourites too. We have many unique animals here in Australia. We hope you make it here one day! Beautiful Captures, Excellent Photography. The Eungella National Park is one of most beautiful park on earth where we see lot of range of bird species. It is an amazing place to know about Australian Wildlife. You have captured awesome pictures of Platypus and Crimson Rosella. Hi, Karan. Eungella is one of many beautiful national parks in Australia and it’s one of our favourites because of the platypus and birdlife. Also, it gets freezing in winter and is so beautiful up there with a cosy fire! Thanks for visiting our site and your comments. Just fall on your content and i found it very interesting, and nice photography as well, we went there my husband and i and we saw the platypus, for me (dalida) it was a first time but never got a picture, thanks for sharing. Thanks for your comments Dalida. Eungella is a great place to see the platypus, but you do need to spend a couple of days there if you want to photograph them.